If you've followed my progress with the Moskito over the past three years, then you know the amount of time, effort, blood, sweat and tears I have spent on it. This time last year, I was ready to give the stupid thing away. Each time I'd fix one problem, two more would show up and terrorize me. I finally had to just put it in a corner and walk away from it for a while. Then it happened. I had it sitting next to the Deztaz, still dirty from the last attempt to use it, looking very sad and dejected. I don't really know what it was about it, but I suddenly went from hating it to feeling sorry for it and decided to make it work correctly. Let's move forward from the Spring Valley Race to the present and I'll get up to speed on what's happened to it and what's happening with it. The last year with the Moskito's been interesting to say the least. 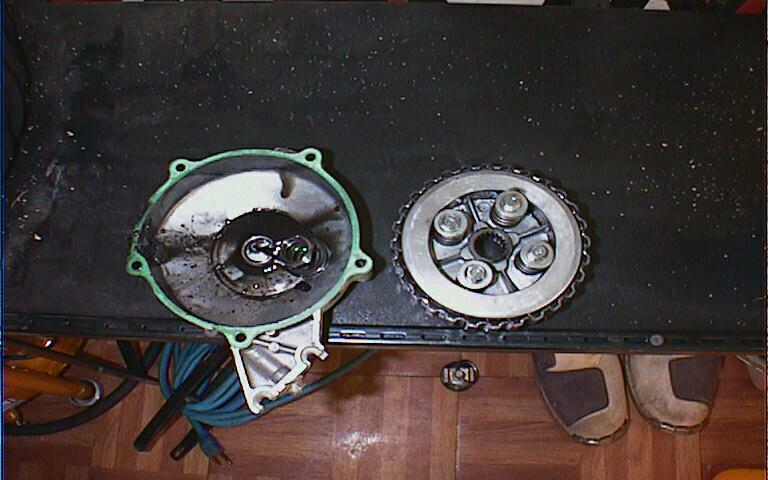 It gave me great hope at the race in Spring Valley (5/28/01) but let me down during the race by having a nut come off the slipper clutch. 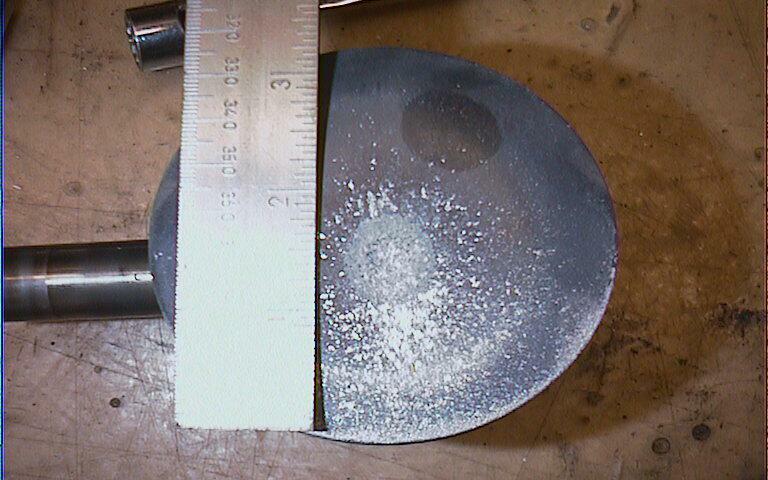 It gave me a hint that it might work at Silver Lake, but old fuel (left over from Spring Valley) caused detonation, a nicely holed piston and killed it again. After a new piston and new fuel I took it to Coal Creek down in Tennessee. All started out well, but a sharp turn around a tree quickly pointed out a clearance problem with the banjo bolt that attaches the front brake line to the caliper and the lower front a-arm. The arm tore the banjo open and I suddenly had NO brakes! Let's just say that I'm VERY happy that I was able to get the Moskito stopped before the next corner. When Redrider and I came back through the same area on our bikes, we found out that the trail dropped off VERY severely - it would have been a SCARY ride down the hill! Fortunately we had a few spare zip ties. I got creative with them and a stick and was able to regain enough brake force to make it back to camp. This was pretty much the straw that broke my back. I was done, tired, fed up and just plain pissed at it. 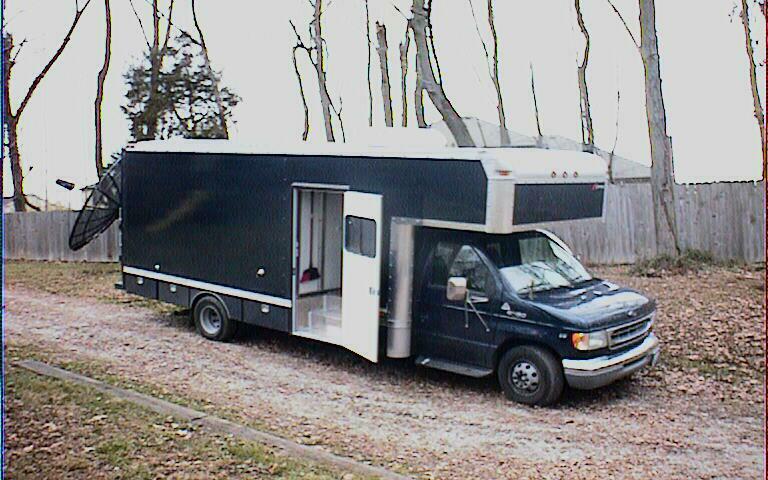 I left the Moskito in my trailer for the winter. First things first. I had to make my brakes work. The clearance problem was pretty easy to solve. I had to grind away a bit of room for the new banjo bolts, but that wasn't a big deal. They were now out of the way and pretty much impossible to tear up. Since I was redoing the front end, I also decided to address the serious bump steer that I was experiencing. 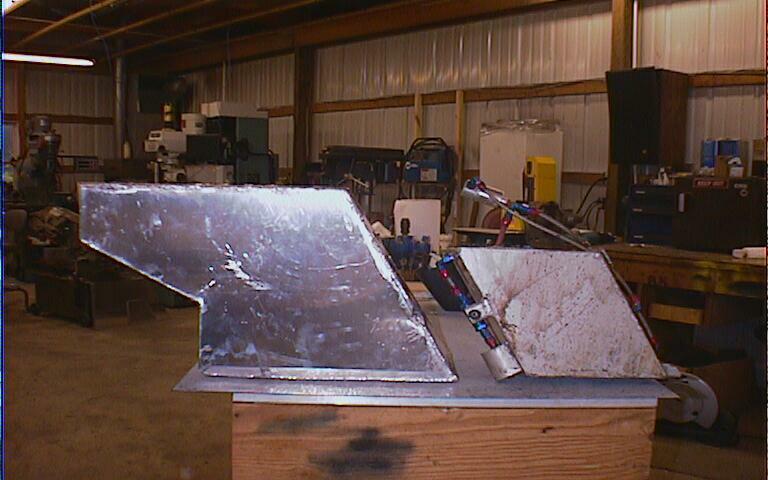 An evening with a BFH (Big F****** Hammer), sawzall, welder and such and the front end was done. No more bump steer, brakes that worked. You know, it just might be a start. 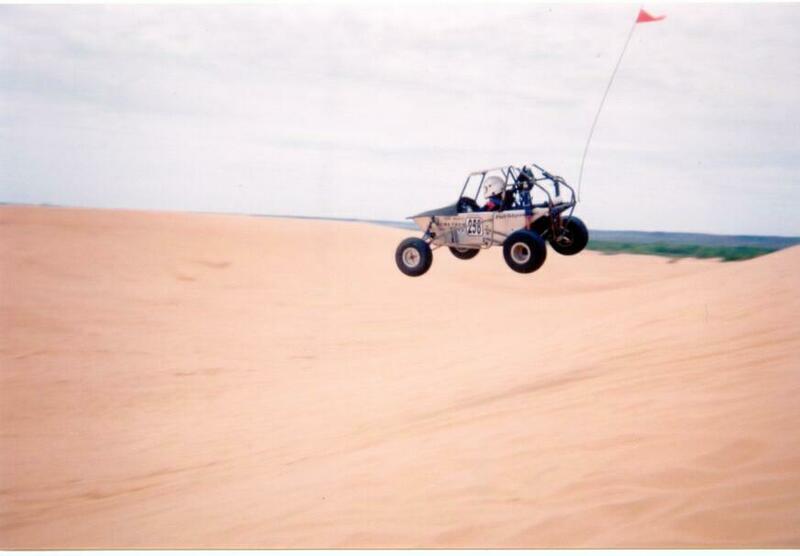 The Pilot-Odyssey group decided that they were going to hit Little Sahara (LS) in Oklahoma for a week of fun and play. 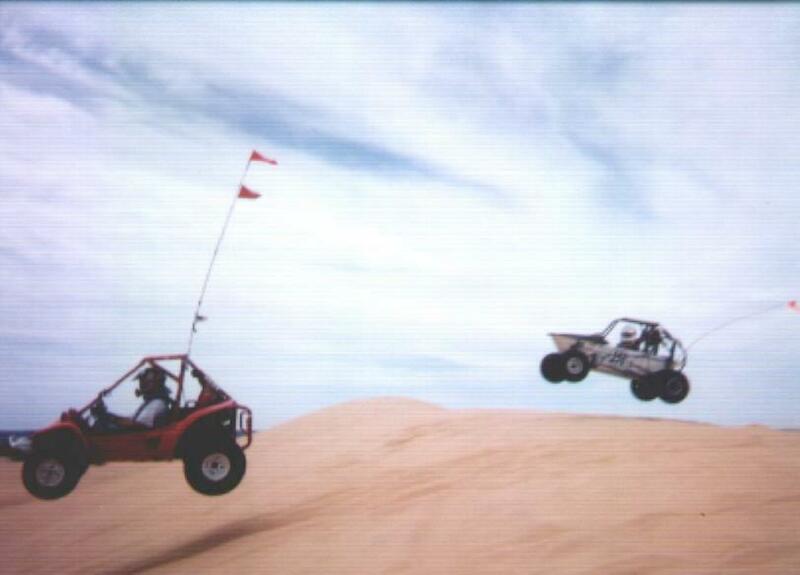 The date happened to coincide with me heading out to Phoenix for a desert race in Mexico with Deztaz. As always, I took the YZF as backup, but for the first time, I didn't need it! The Moskito decided to play nice - and nice it was!!! I expected it to do its usual game of run well for five minutes and then DROP like a fly. No, not this time. It FLEW instead!!! In two days I ran more fuel through it than I had in the past two and half years. It would go anywhere, I could jump anything I wanted too, and it handled fantastically. 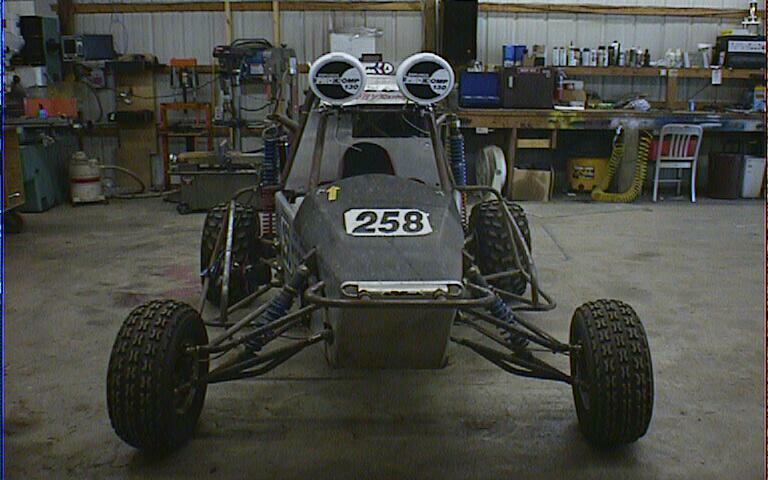 I still needed to work on rear shock valving, but that was minor compared to all the other crap I'd put up with. I did have a couple small issues beside the rebound in the rear shocks being wrong. 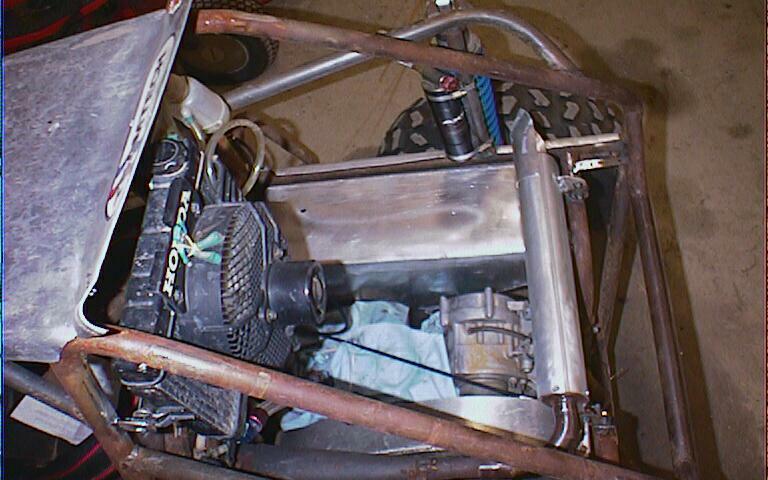 The 3.5 gallon fuel cell was way too small for the thirsty race fuel drinking 500 motor. 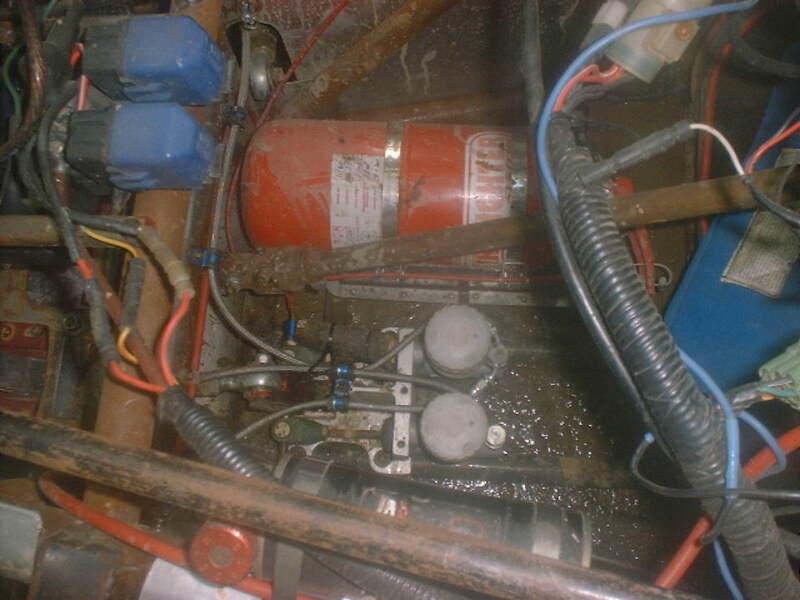 My jetting was very rich, which didn't help with fuel economy, but it wasn't enough to really bother with. 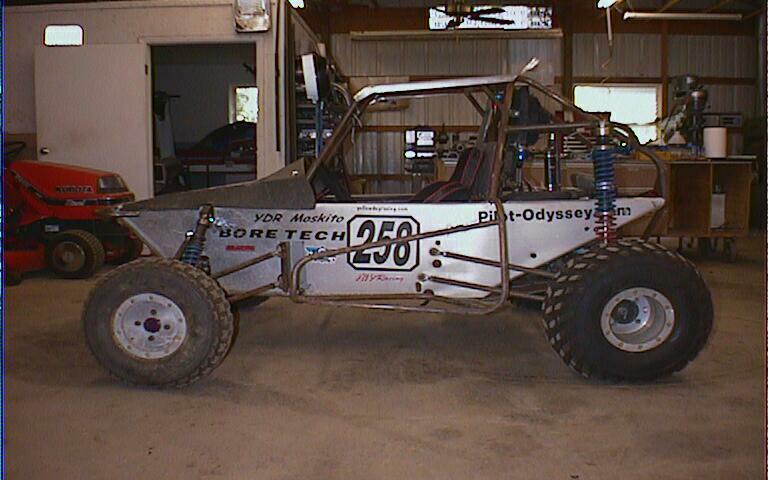 Also, the tires I started out with didn't have enough traction in the sand. I could spin them at will with a stab of the throttle. An evening spent around the camp fire (actually the back of the BBB), saw an old set of Dunlop Rovers entertain us as PilotHawk showed us how to use starter fluid to bead a set of tires. Too bad that they leaked beyond repair. I ran then the next day and had one come off the rim. It didn't seem to slow me down, though. After two days of beating myself into submission with the Moskito, I decided to load up and head on out to Phoenix. So far the Moskito had proved itself way beyond what I had expected. In fact, I was so pleased with it that I decide that some modifications might just be in order. I wasn't sure yet, but the next outing proved that it needed them. About two months later I loaded up the BBB with the Moskito, the YZF and the Killer XR-50 and headed out to Statesville, North Carolina for a weekend of abuse with/from Rocketman (Mark), Redrider (Steve) and Matt. (very good friends of mine from the Pilot-Odyssey group). The Moskito ripped! I was using the trees to help turn in some of the tighter corners. Hook the inside front on the tree and as I'd snag the brakes the car would pivot right around the tree. We had a blast chasing each other, getting covered in dust and killing a few trees. The next day Mark had arranged for us to go to a motocross track. Just the four of us. This place was killer. The only real problem was that just about every jump on track was peaky (not good for cars) and the double jumps were penalty bumps if you landed wrong. They threw the back end of the car up very badly and my rear shock valving just compounded the problem. I had a horrible time keeping the rear end of the car behind me. It kept wanting to pass me over my head. If I'd just had the shocks right, that place would have been awesome! I did finally "break in" the Moskito too. I finally got the guts up to attempt one of the medium doubles. Got the line out of the corner, popped over the first little double and then hit the second one. Last thing I remember seeing before I shut my eyes was the ground coming up really fast. I landed straight down on the nose, felt it hit one more time (on it's rear end) and then as I opened my eyes, the world was cocked over about 45 degrees and falling back into place. A perfect three point endo. Nose, tail, wheels. 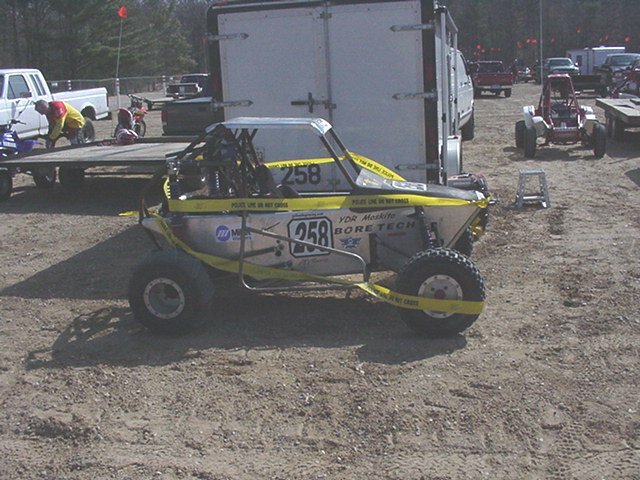 I didn't hear anything break, nothing seemed like it was rubbing, so I hit the gas and did two more laps before going back to the pits. The only damage was my front bumper. It was now a three piece bumper - which is what it started out as. I managed to break the loops off both ends. No big deal. That's what bumpers are for! We played until we couldn't play anymore and headed back to Mark's. A great day, all in all. So all this leads up to now. The Moskito's working great. I'm in the process of updating and modifying some things to make it better and after that, a bit of chassis tuning and some more seat time and I think that the Moskito's probably going to surpass what I could have ever expected from it. I guess that after all the crap I've had to deal with, it's going to be worth it. Right now, the engine's apart. Time for a new piston and some Secret Squirrel Speed Werkz attention. Bill Moeller of Bore Tech is taking care of that part for me. No more race fuel. A new head set up for super unleaded has been done. I moved the battery from between my feet (very limiting on space) down below my right leg to where the fire system bottle used to be. I moved the radiator up and over for better air flow (not that overheating was an issue). I moved the seat back and tilted it back a bit for better seating position. There's now an upper fire wall behind the seat, hoping to cut down on the noise level in the driver's area a bit. The steering wheel's been increased in size by two inches and moved back about two inches for better leverage and control. 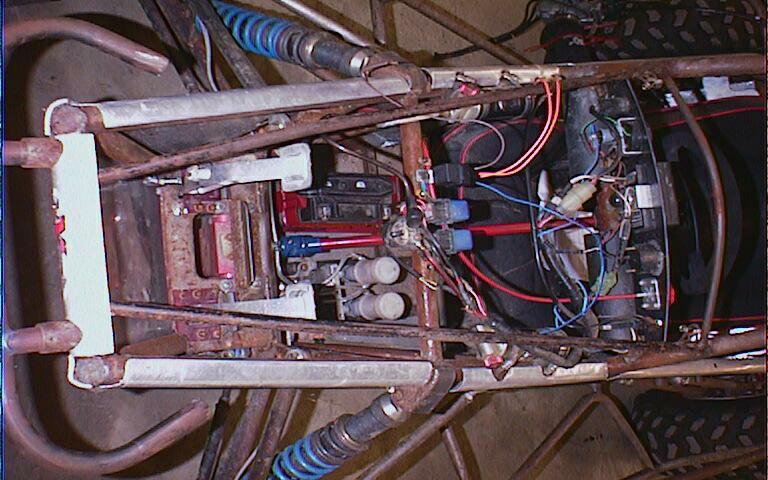 Rebound in the rear shocks has been stiffened up. Lights (rear, front and brake) have been added. 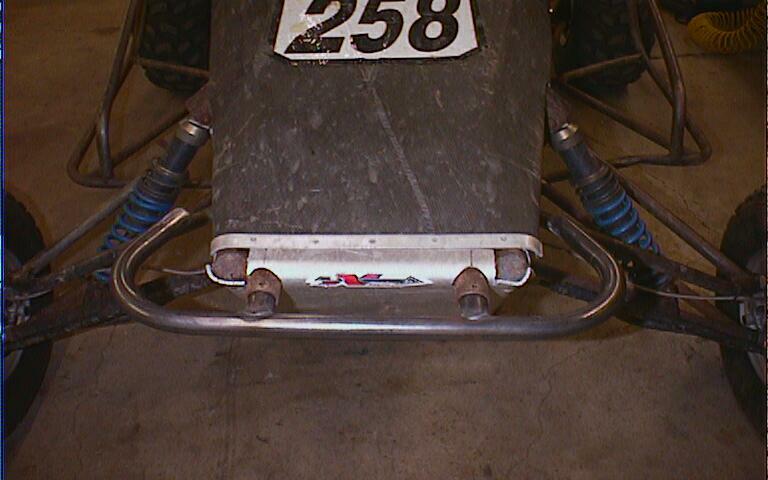 A deflector for the muffler's been added to keep the heat off the right rear shock and away from the new fuel tank. And speaking of fuel tanks - the old 3.5 gallon tank's been removed and replaced with a 9.7 gallon tank. No more short trips! 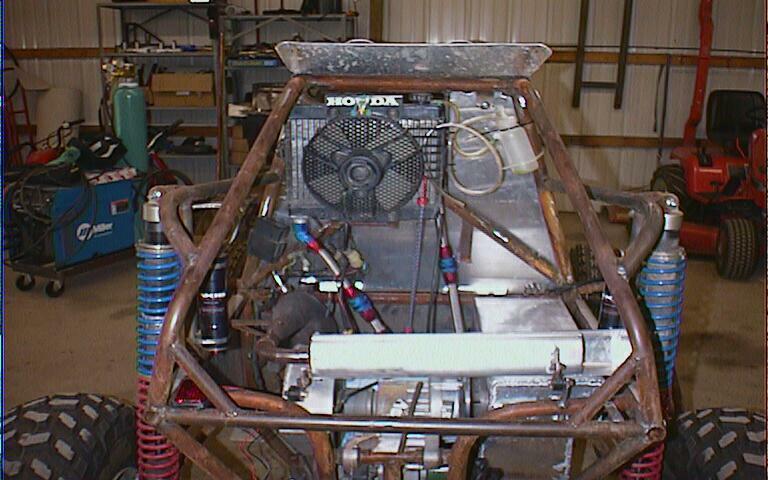 I hope to have the Moskito all back together and running by the end of the month. As soon as I get a chance, I'll go run it and let everyone know how it's working out.